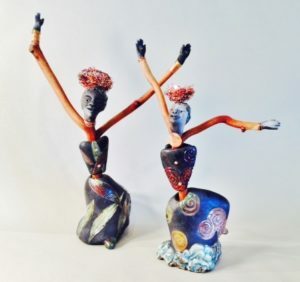 This month’s show, “Gateways and Three-Dimensional Sketches”, features Lorene Senesac’s Raku wall pieces, figures, and healing bowls, and wire sculptures by George Popa. Tradewinds Duo (Tom Silver and Ed Chizek) will play on first Friday. 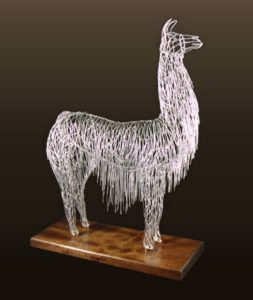 All of George’s sculptures are made from wire and silver solder. George created his first sculpture as a gift for a friend who had everything. His major works include a large model of the ship “Cutty Sark” commissioned by the San Diego Maritime Museum. 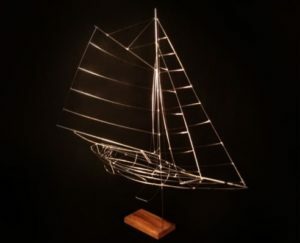 The New York Yacht Club presented his model of the two-time America’s cup winning yaght, Intrepid, to the captain who first skippered it to victory, Bill Ficker. George’s sculptures have included sailboats of every type, Chinese Junks, powered and unpowered aircraft, automobiles, famous landmarks such as The Golden Gate Bridge, individual members of a girls soccer team, whales, herons, seahorses, birds in flight, hot air balloons, horses, small gift items such as hummingbirds and butterflies, and wall sculptures such as jazz bands, elephants and musical notes. Lorene’s work features clay sculptures predominately depicting portals or gateways leading the viewer on a journey. She has been inspired by dreams and her travels to ancient and sacred sites on this continent and abroad. The mystery evoked by partially hidden doors and steps curving beyond sight has always drawn her. Lorene is reminded of possibility and choice, each path a different future, each door opening to another experience. Lorene’s sculptures are most often Raku fired. 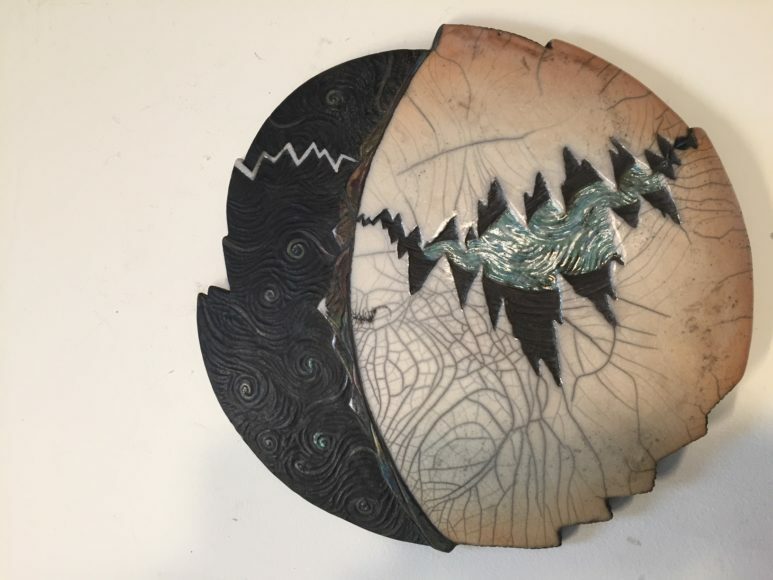 This method produces lustrous metallic and crackle glazes against a black clay body which creates the sense of mystery she wants to achieve. Although her work comes from her own experiences and observations, the intent is to inspire the viewer’s imagination and inner vision.